In working environments that are continuously loud throughout the day, it’s essential that workers take measures toward hearing protection on the job. 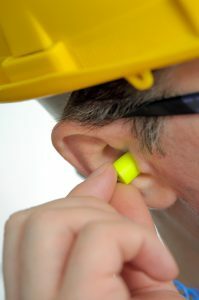 In working environments that are continuously loud throughout the day, it’s essential that workers take measures toward hearing protection on the job. Many people around the world have been affected by hearing loss due to work injuries. There should be a partnership between employers and employees to ensure that everyone is safe while at work, and leaves at the end of the day with all senses working. The amount, range, pitch, and source of noise can all be calculated and measured. Once they reach the outer ear, vibrations begin to move toward the eardrum which facilitates and translates auditory stimuli into the sounds that we hear. Units of sound pressure, also called decibels, are measured on a scale. It assigns a number to each decibel and measures the differences on the scale that corresponds to the volume of the sound. A range of 85 decibels and over is potentially dangerous to nearby workers, so hearing protection is even more vital. Let’s take a closer look at why. Deafening noises have a damaging effect on the cochlea, the part of the inner ear covered by microscopic hairs. When those hairs are damaged or destroyed, the result is hearing loss. When workers are regularly exposed to loud noise, this hearing loss could even eventually become permanent. There are also cases when singular events cause short-term hearing loss, which will affect an employee’s overall quality of life. Long-term damage may inhibit people from being able to hear at higher frequencies or understand speech. In addition to physical ear damage, being in an environment with exposure to constant high decibel sound can also cause stress and anxiety. In work environments where there is a risky exposure to high decibel sounds that could cause hearing loss, both employers and employees need to be mindful of those effects and take the proper measures to ensure the safety of everyone at the job site. Engineering controls include displacement, replacement, and other physical changes that control or eliminate the noise. Barrier, insulation, and proper machine lubrication bring down noise levels. On an administrative level, providing quiet rest areas and limiting shifts with exposure to loud noises also enhances the safety of workers. Also, noise-canceling devices like earplugs or over-the-ear earmuffs are essential in these environments. G&M Services has a great amount of expertise, experience, and training when it comes to demolishing concrete, so trust us with the job. We understand how dangerous our important work with concrete can be, and we take safety precautions every minute of every day to prevent anything catastrophic from happening. We offer many different services to our valued clients, including concrete drilling, concrete scanning, FireStop, and employee safety training. To learn more about our services, contact us online or give us a call at (410) 787-8828. For more safety tips and interesting articles, follow us on Facebook, Twitter, Flickr, and LinkedIn. This entry was posted on Friday, December 8th, 2017	at 9:57 am	. Both comments and pings are currently closed.